Of Manners and Monsters: The Lawlessness of Stephen King's Reverend Lester Lowe – AiPT! The two monsters that haunted my dreams were vampires and werewolves. Growing up I was terrified of monsters. Why wouldn’t I be? The 80’s provided an endless supply of creatures to fear. From Ghoulies in the toilet, living killer dolls, rocker vampires, or a vengeful entity that would kill you in your dreams, to zombies at the mall, monsters infiltrated every part of society and the domestic sphere. The two monsters that haunted my dreams and fueled my daytime imagination were vampires and werewolves. My fear of vampires was quelled by the knowledge that they could not enter unless invited. A number of rules apply to vampire lore and it seemed that if one was simply aware, they could easily ward off an attack. But what about werewolves? There were no etiquette rules or social impediments when it came to them. What could a potential victim do to protect themselves? I was probably about six years old when we first rented the 1985 film Silver Bullet, and it was then through parted fingers clamped over my eyes that I learned the human race is powerless against the werewolf. Silver Bullet was adapted from Stephen King’s short story “The Cycle of the Werewolf.” While I was utterly terrified of the werewolf in John Landis’s American Werewolf in London, the character of David Kessler (David Naughton) was sympathetic and terrified of himself. All of David’s victims were London citizens who happened to be at the wrong place at the wrong time. 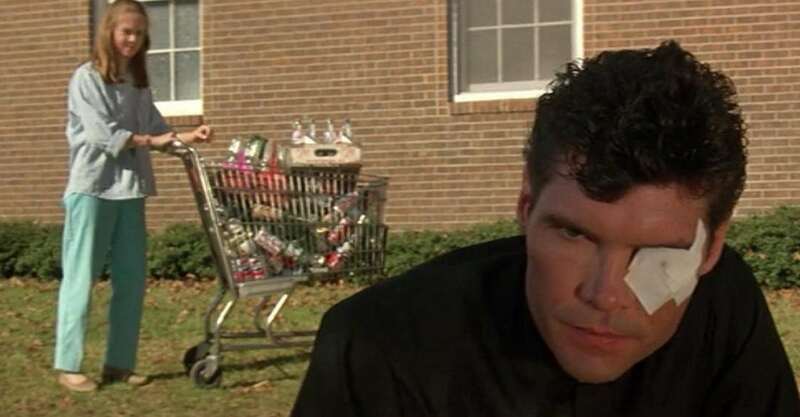 Whereas Reverend Lester Lowe (Everett McGill) of Silver Bullet seems troubled by his double nature, he also seems to delight in it. Exacting penance on the townspeople of Tarker’s Mills, Lester Lowe explains to Marty Coslow (Corey Haim) that he killed one woman because she was contemplating suicide. During that killing, he smashed through the woman’s second floor bedroom window and tore her apart. This is a very deliberate killing, not at all the kind of killing seen in other films where the victims find themselves in dark streets or woods. The werewolf uses his humanity to fuel his killings. Although, the reverend hunts Marty with an almost fervent pleasure, there is evidence in the film that he is afraid of the wolf inside of him. There is a moment when Lowe wakes up from a dream drenched in sweat and terrified. In the dream, the entire congregation turns into werewolves. Horrified he wakes up and prays to “let it end.” He also tries to warn the town hunters about looking for the killer on a full moon night. Tragically, they do not heed his warning and many die. Glimpses of humanity are shown, but it’s Marty’s bottle rocket to the eye that exposes Lowe as the werewolf. After this, what was left of Lowe’s humanity is gone and he targets Marty and grows angrier waiting for the right moment to strike. Reverend Lowe and the werewolf have become the same being with the same goals and this is where the rules fly out the window. There is no town curfew or locked doors that can protect Marty. The werewolf rips through the side of the house, smashing through walls. As an adult, I do not feel the same fear I once felt for Silver Bullet. But I often think about the cold methodology of his killings. The film’s lore offers no protective omens or wolfsbane. The Reverend could not care less if you formally invite him. If he wants to kill you, he will.